“Time travel is really hard to write about,” said a character from NBC’s comedy Community. And I’d have to agree with that assessment. It’s hard to write about, but it’s even harder to live. 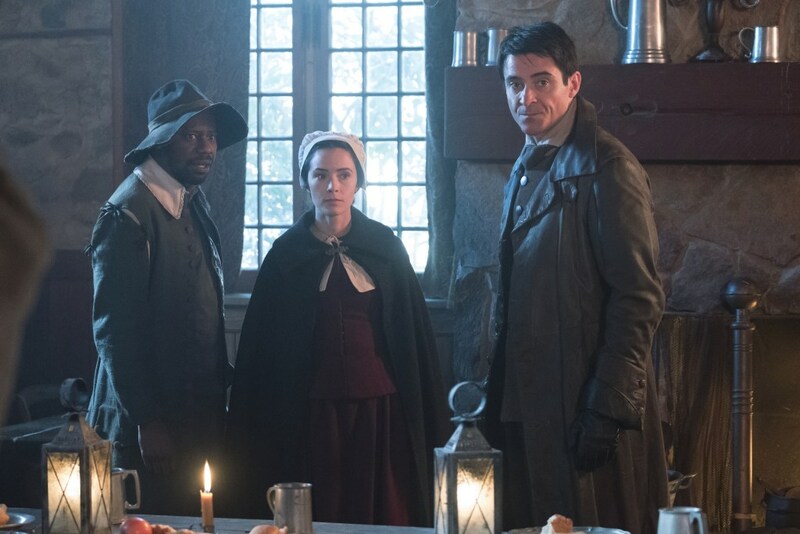 And that’s precisely what our Timeless characters learn in “The Salem Witch Trials.” When we last left Lucy, Wyatt, and Rufus, one of them discovered that his once-dead wife was suddenly very much alive and this episode sees the fallout of that revelation. Moreover, it is an episode that refocuses on the time loops and paradoxes that occur because of time travel. Ready to head back to 1692? Good, because we’re about to fly straight into the height of the Salem Witch Trials. Remember how Wyatt and Lucy were blissfully happy just an episode ago? Yeah, on Timeless (like with most dramas, I suppose) a couple’s happiness is short-lived. This time, Jessica crashes the party by showing up alive. Wyatt receives a text from her and bolts from the bunker. Frantic, Lucy calls him repeatedly and he finally answers to deliver the bad news. Or good news. Lucy, bless her heart, lets a few tears slide down her cheeks as she tells Wyatt that he is happy for her. She’s not happy, of course — and Wyatt is astute enough to know that. They have something special. They have love. They might have had a future. But Lucy also knows that Jessica was always the thing Wyatt fought for, from the beginning of their journey. She won’t be the person who stands in between them. Wyatt’s response is to apologize to Lucy, and you can tell that he is incredibly torn about his current situation. His voice betrays a hint of emotion, and Lucy lies to him when he asks why she called. That’s the kick-start to her character arc this week. With Wyatt out of commission this week because of the Jessica of it all, Lucy and Rufus are forced to admit that they need a white guy to fill Wyatt’s place. So Flynn hops aboard the Lifeboat and heads back to 1692 with the gang, where Rittenhouse apparently has landed to wreak havoc. At the height of the Salem Witch Trials, Lucy, Wyatt, and Rufus run across a woman in the woods who vows to speak out against the hangings that have occurred. And she does so, boldly, at a local pub. John Hathorne is there, pronouncing that there will be nine executions. Lucy is bewildered — there were only supposed to be eight. When the young woman from the woods counters the arguments of the women being witches, she too is accused of witchcraft and hauled away. Our Time Team then learns that this is Benjamin Franklin’s future mother, Abiah. And now they’re on a quest, convinced that Rittenhouse landed in Salem in order to kill her so that Benjamin Franklin — a man who encouraged speaking out against injustice — would never be born, thereby furthering the narrative of tyranny Rittenhouse is so fond of. So as the Time Team wanders around the town, trying their best to figure out who accused Abiah of witchcraft, they draw attention and soon, Lucy is being accused of witchcraft herself. And who accuses her, you ask? Carol Preston, her dear mother. Carol is the one who chose the mission and she’s the one who accused Abiah. All Carol claims that she wants is for Lucy to come home with her. They can still be a family together and fix things. But Lucy sees now, quite clearly, that her mother is a monster. She knew it of course, but she finally looks at her mother and tells her that she would rather hang than go back with her. Nevertheless, Carol hands Lucy a knife and tells her that she will be at the Mothership — this might be the last chance for them both. You see, as morally terrible as Carol truly is, she still won’t kill Lucy herself. She cannot. But she is willing to let others die for the sake of Nicholas’ vision of the future. We’ll talk a little bit more about Carol later on, but let’s refocus on Lucy for a moment. When Lucy and Flynn meet with Bathsheba and her husband, the woman tries to deny accusing witches. But Lucy knows history, and knows that Bathsheba (who is Abiah’s sister) did accuse those women, and in order to get a confession out of her, she gives Flynn the nod — a signal to do what it takes. So Flynn knocks around the husband a bit while Lucy turns her back. Weird, right? That’s not very Lucy-like. But when she turns back around, Bathsheba is confessing and Flynn refrains from beating up the husband. Even Rufus notes how odd it is that he and Lucy are working with Flynn — a man who essentially prophesied once that they’d be fighting on the same side together some day. While Flynn has his issues, undoubtedly, he is loyal to Lucy and Rufus in the episode. He seems to run away when Lucy is accused of witchcraft, but he’s really returning to Bathsheba’s for the shotgun he knows is there. He takes down Puritans so that the women of Salem can escape hanging. And at the end of the episode, he does something uncharacteristic: he encourages Lucy. The episode opens with Flynn noting that Lucy has become hardened, and that Rittenhouse must have been heaven compared with six months of solitary confinement. Lucy retorts with sarcasm about being held prisoner by her mother. That shuts him up for a bit. And at the end of the episode, Flynn tells Lucy something she did not need to hear but was nice anyway — she is nothing like her mother. He’s seen what Carol is truly capable of, and Lucy is nothing like her. Lucy changed history and saved nine women from execution. The historian in her would have fought against that in season one. But now? After losing Wyatt because of a timey-wimey Rittenhouse move and her mother’s betrayal? Lucy does not care anymore about the things she changes. All she cares about is stopping Rittenhouse and saving the good guys: “It’s not what I’m willing to do, it’s what I’m not willing to do,” she tells Flynn. Lucy is no longer going to allow innocent people to die just for the sake of preserving history. And weirdly enough, this now puts Flynn and Lucy on the same side. What’s even more interesting is that I think — in spite of my love of Lyatt — that Flynn is what Lucy needed this episode. He’s unhinged in so many ways and Rufus says that he misses Wyatt (which I know Lucy does too), but the little chat and Flynn’s newfound understanding of Lucy’s torture allows him to trust her. And in trusting her, Flynn proves his loyalty to her. He opens the episode mocking her, but ends it encouraging her in the best way he can. That doesn’t erase the issues Lucy or I have with Flynn. And it certainly doesn’t mean that I would prefer Flynn to Wyatt. But the sentiment Lucy received from Flynn is different — simply because it’s coming from Flynn. ... And then the Lifeboat returns. Wyatt — in a move that is supremely dumb because I’m 100% sure Jessica is either a Rittenhouse agent or at least brought back by Rittenhouse to destroy the team — brought Jessica to the bunker to witness the Lifeboat and time travel stuff firsthand. When the ship returns, Wyatt rushes forward to see the team. Lucy sees him and immediately relief washes over her... until she sees Jessica also standing there. Man, there’s so much unspoken in that scene. In spite of Jessica being there, Wyatt wants to protect Lucy. He only hesitates on the stairs for a moment when he sees Lucy looking at Jessica, but his instinct is still to protect Lucy (who is holding her injured arm). And then Flynn steps out of the Lifeboat, and Wyatt visibly pauses. Flynn puts an arm around Lucy and escorts her down the stairs. It’s a blow to Wyatt — first because he doesn’t trust Flynn and the team let him on the boat in the first place. Secondly because Flynn is now doing Wyatt’s job: protecting the team. Back in season one, Wyatt told Lucy and Rufus that he found his purpose, and it was to protect the both of them no matter what. You can see, just by his face, that Wyatt realizes he gave that job away the minute he went after Jessica over staying with the team. Kudos to Matt Lanter for that subtle acting. And still, at the end of the episode, Wyatt wants to start over with Jessica. He tells her that he’s literally a different person than the man she was married to and “The Salem Witch Trials” ends with the plea to start over. A sub-plot of the episode is that Jiya has a vision Rufus will kill a Puritan guy by shooting him. So Rufus and the team spend their time in Salem trying to figure out if the guy is a bad dude. Rufus eventually confronts him in the woods, and the two have a brief standoff before the guy lowers his gun on Rufus. Hooray! Jiya’s vision didn’t come true! That is, until the man walks away and gets run over by a horse and carriage. He dies anyway, and as a result, Rufus tells Jiya that he doesn’t want to hear about her visions. Emma continues to annoy me, and now Nicholas is irritating me too. Meanwhile, Carol is pretty much on thin ice with them. After not being able to kill Lucy or stop them from rescuing accused witches, Nicholas and Emma decide to take over the Lucy mission and bench Carol. Nicholas says he doesn’t blame her because she’s “only a mother.” Ouch. Wyatt putting Jessica on a pedestal seems like foreshadowing, no? I’m like, 100% sure she’s either going to die or be revealed to be a Rittenhouse agent. Abiah is awesome by the way. I want more episodes with her. I’m trying to think of where I’ve seen the actor who played Bathsheba’s husband and I want to say that it was in Suits. Tell me if I’m right, Internet! “I didn’t shoot you! You’re not supposed to die!” What heartbreaking delivery from Malcolm Barrett. OH MY HEART WHEN LUCY REFUSES TO LET FLYNN HELP HER WITH HER SEATBELT BECAUSE THAT WAS WHAT WYATT DID. What did you all think of “The Salem Witch Trials”? Sound off in the comments below! HI Jenn! I don’t see any other Timeless reviews past this one. Did you stop watching?